In case we weren’t already excited enough about the return of Community on March 15, the fine folks at NBC have decided to whet our whistle with some animated shorts. The obvious question: Why didn’t they think of this a long time ago? That animated holiday special in 2010 (has it been that long?) rocked. The pilot episode of Abed’s Master Key is only a precious minute and 56 seconds long, but to fans so long deprived of a meal, these are succulent little crumbs. The episode just gives us a quick look at all of the main characters–the study group and Dean Pelton–hanging out in their usual spot, the study room that has seen everything from a zombie uprising to some Jeff-Britta coitus. The Dean gets the bulk of the lines. Although Jim Rash is a big Oscar-winning stud now, he’s probably not the character we want to hear the most out of. Abed‘s name is in the title, after all. The Dean entrusts Abed with a new unpaid job and a shiny key that looks like it may later prove to hold some kind of magical powers, and Abed himself looks rather elf-like. One would expect that an animated web series starring Abed would engender some element of fantasy–here’s hoping! Each of the other characters only has about one line, but there’s just enough there to see that each is his or her same old self. All told, it’s maybe not as edgy as one would expect from the show that brought us a paint ball apocalypse. They go for a couple of really obvious jokes, (“You look extra animated this morning.”) and a reference to beer pong (kind of 2008) but who cares! It’s Community! Perhaps later we’ll run into Chang, Starburns, and the rest. The existence of this new series excites me, and not just because we’ve been Greendale deprived. 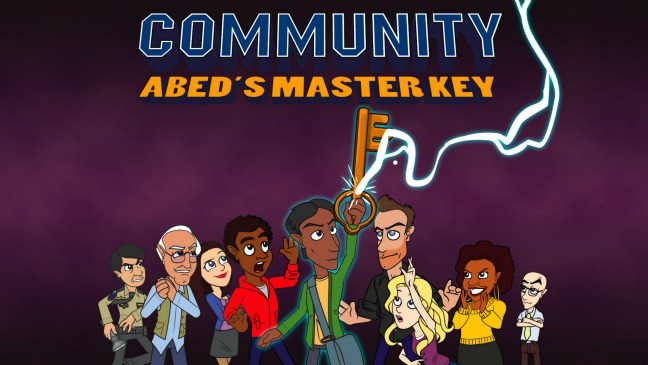 I’m gonna go out on a limb and predict that, if Community is cancelled after this season, as it very well might be, the animated series is already on deck to take its place. Since the convention in animated shows is that the characters don’t age, a show about a bunch of people going to community college could have a much longer and more believable shelf life than a live action show about seven losers. Just think, Abed, Troy and Annie could live together in an apartment with a blanket fort for a room for decades! This entry was posted in 2010s, Animation, Comedies, Web Shows and tagged abed, abed's master key, animation, community, greendale, jim rash, nbc, paintball by meekthegeek. Bookmark the permalink.